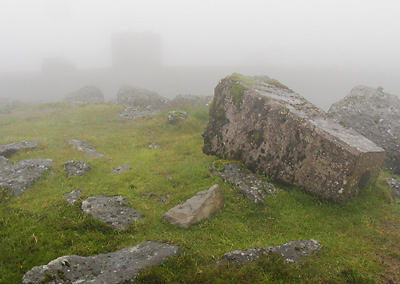 Picture from simon3 : Seefin's fallen trig. The summit trig pillar has fallen on hard times. Fortunately the mist restricts our view of the concrete monstrosity, mentioned by Jackill, in the background. The vehicle to the left of the monstrosity is a 4WD. Usually I can't say I want these things on mountains (or in cities). However I would make an exception for this occasion where it was bringing organisers and supplies for participants on the annual Comeragh Challenge.